ISCA’s bedrock program is its scholarship award to help support aspiring young artists achieve their dreams and goals. 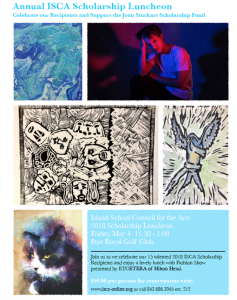 The Island School Council for the Arts (ISCA) is pleased to provide the 2019 ISCA Scholarship and the Joan Stuckart Memorial Scholarship application. Every year ISCA selects graduating seniors, who have displayed excellence in the arts and are planning a four-year course of study in an arts related field. These single disbursement scholarships are paid directly to the university or college for the 2019 fall semester only. Please note all completed application packets must be received by 3/16/19. The Island School Council for the Arts proudly supports 15 students as they pursue a major in the literary, performing or visual arts. $500-Lanier Bradberry, a senior at HHIHS plans to pursue a degree in Visual Arts at the University of South Carolina. $750- Zoe Keller, a senior at John Paul 2 plans to pursue a degree in Visual Arts at the College of Charleston’s Honors College. $750- Brad Tigges, a senior at John Paul 2 plans to pursue a degree in Architecture at either Wofford, Dickinson, Mercer, Clemson, Providence, and Auburn. $1000-Jordan Crosby, a senior at HHIHS plans to pursue a degree in Visual Art at Winthrop University. $1000-Abbigale Gross, a senior at HHIHS plans to pursue a degree in Photography at either University of South Carolina, Clemson University, College of Charleston, Savannah College of Art and Design (SCAD), School of Visual Arts (SVA), and Columbia College, Chicago. $250- Sam Warren, a senior at HHPrep plans to pursue a degree in instrumental music at Berklee School of Music. $400- Martha Preston Collins, a senior at HHPrep plans to pursue a degree in Dance at the College of Charleston. $400- Kalaylah Chisolm, a senior at HHIHS plans to pursue a degree in Theatre Education at Winthrop University. $400-Eston Parker, a senior at HHIHS plans to pursue a degree in Journalism/Creative Writing at Florida Atlantic University. $500- Adam Babington, a senior at May River High School plans to pursue a degree in in instrumental music at the University of South Carolina. $700- Davis Lentz, a senior at HHCA plans to pursue an instrumental degree at either Berklee School of Music or the College of Charleston’s Honors College. $700- Kevin Myhre, a senior at HHCA plans to pursue an instrumental and vocal music degree at the College of Charleston’s Honors College. $750- Nick Myrhe, a senior at HHCA plans to pursue an Arts Management degree at the College of Charleston’s Honors College. $1000- Cassie Maurer, a senior at HHIHS plans to pursue a BFA in Musical Theatre at the University of Cincinnati’s College Conservatory of Music. $1000- Shannon Hegarty, a senior at HHPrep plans to pursue a BFA in Musical Theatre at either the Belmont, Clemson, Florida State, or Pace University. Each of these students has displayed excellence in the arts as well as superior academics throughout their high school careers. Congratulations to all of our 2018 ISCA Scholarship Recipients!! ISCA proudly awarded a total of $13,250.00 to 16 graduating seniors from Bluffton High School, Heritage Academy, Hilton Head Christian Academy, Hilton Head Island High School, Hilton Head Preparatory School, Home-School, May River High School and John Paul II!! Bluffton High School senior, Jacob Ryan is awarded $500 to support his pursuit of a major in Visual Art at the College of Charleston. May River High School senior, Jordyn Thomas is awarded $750.00 to support her pursuit of a major in Illustration and Sequential Art at the Savannah College of Art & Design. Hilton Head Christian Academy senior, Natalie Wade is awarded $750.00 to support her pursuit of a major in Communication Art & Design with an emphasis on Studio/Visual Art at Lees-McRae College. Bluffton High School senior, Lyndsay Hyer is awarded $1000 to support her pursuit of a major in Visual Art at Southern Virginia University. Hilton Head Preparatory School senior, Alex Wynne is awarded $1000 to support her pursuit of a double major in Studio Art with concentrations in painting and photography and Historic Preservation at the College of Charleston. A $500.00 ISCA Scholarship was awarded to Hilton Head Island High School senior, Lydia Novak to support her pursuit of a major in Journalism at Penn State University. A $500.00 ISCA Scholarship was awarded to John Paul II senior, Leslie Nunez to support her pursuit of a major in Interior Design at SCAD. A $500.00 ISCA Scholarship was awarded to Home -schooled senior, Skylar Stephens hopes to attend NYU in the fall to pursue a major in Theatre. A $750.00 ISCA Scholarship was awarded to Heritage Academy senior, Kathleen Colquhoun to support her pursuit of a major in Interior Design at SCAD. A $750.00 ISCA Scholarship was awarded to Hilton Head Christian Academy senior, Rebecca Donaldson to support her pursuit of a major in Theatre at Ole Miss. A $750.00 ISCA Scholarship was awarded to Bluffton High School senior, Calista Schultz to support her pursuit of a major in Theatre with an Education emphasis Winthrop University. A $1,000.00 ISCA Scholarship is awarded to Hilton Head Christian Academy senior, Olivia Williams to support her pursuit of a major in Theatre at AMDA. A $1,000.00 ISCA Scholarship was awarded to Hilton Head Preparatory School senior, Ava Nixon to support her pursuit of a major in Theatre/Vocal Music at Clemson University. A $1,000.00 ISCA Scholarship was awarded to Hilton Head Island High School senior, Sammee Schirmer to support her pursuit of a BFA in Dance at Marymount Manhattan College. A $1,250.00 ISCA Scholarship was awarded to Hilton Head Island High School senior, Katie Maurer to support her pursuit of a BFA in Dance at Point Park University, Honors program. 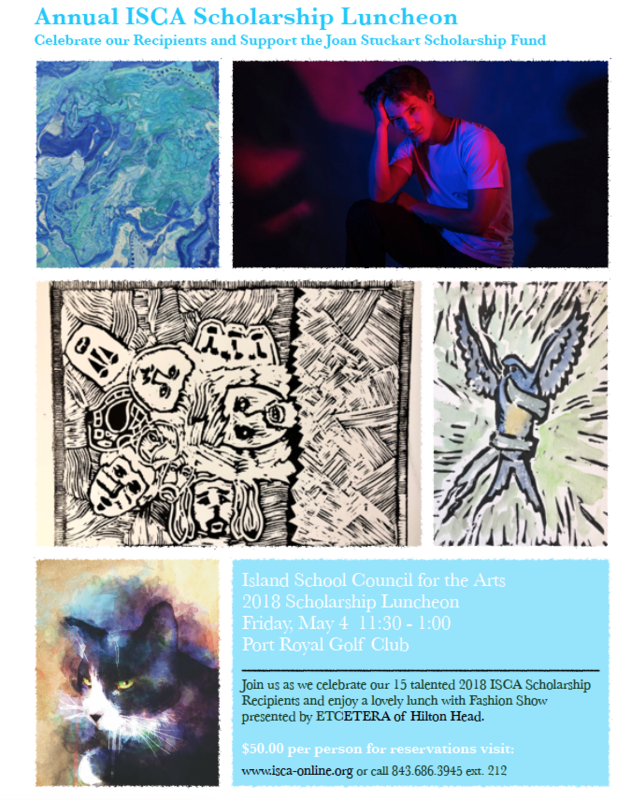 With their creative and innovative spirit, superior academic achievement, and excellence in the arts within their school as well as in the community, each student listed personifies what the Island School Council for the Arts is all about. Congratulations to all of our 2017 ISCA Scholarship Recipients!! 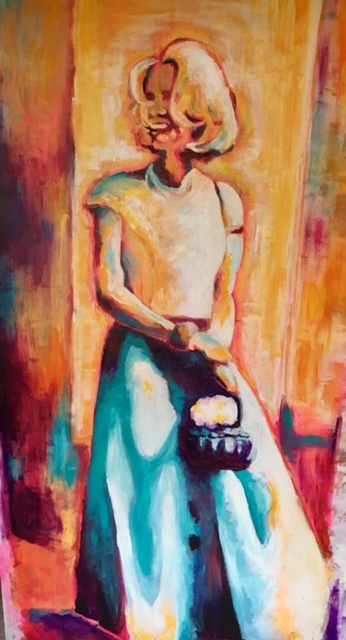 We are Honored to accept donations for the Joan Stuckart Memorial Scholarship Fund designated for our Visual Arts Students through the DONATE NOW button on the homepage of this website. ISCA proudly awarded $1000.00 to each of these deserving applicants. Hilton Head Christian Academy senior, Grayson Lentz will be attending the College of Charleston in the Fall to double major in Music and a Pre-Med. Hilton Head Island High School senior, Tyler Magnin will be attending the University of South Carolina to continue his musical expedition as a Music major. Hilton Head Christian Academy senior, Lilly Strickland will be attending the University of South Carolina in the Fall to further her visual arts skill sets in Graphic Design and Photography. Hilton Head Island High school senior, Chase Sanders will be attending Clemson University in the Fall to further his passion for digital expression in the Graphic Communications Program. Hilton Head Island High School senior, Weston Sanders will be attending Clemson University in the Fall and plans to hone his visual arts skills in the Graphic Communications Program. Hilton Head Island High School senior, Nicolas Yurco will be attending Furman University in the Fall to pursue his dream of a double major in Music Therapy and Composition alongside his major of Environmental Sustainability. ISCA is proud to support our promising artists and to give a total of $4,500 to 9 deserving students with superior academics and demonstrated excellence in the arts beyond their classroom walls!! Congratulations to all of these incredibly talented and deserving students!! !